Something has been stuck in my head for a few days. I was in my studio one evening and I found a YouTube video of Marc Maron interviewing Bryan Cranston from 2011. Marc Maron: Were there points in the career where you were like, this isn’t happening fast enough or this isn’t working out? Marc: That’s amazing, sort of, determination. Bryan: Well, I think it’s because I didn’t have any attachment to an outcome. I think when people enter this business with that, like, you’ll hear people say, “I’m going to give it a year. I’m going to give it a good, solid year, and if I haven’t made it by then…” , and I’m saying, what do you mean? What’s “make it?” What does that mean, “made it?” Everybody has their different idea. But that’s attaching your life to an outcome. But if you love this artform and you commit your life to it, then all you really want is opportunity to be able to make a living. It’s never A to B to C to D. It’s always a different way. That’s what has been stuck in my head: Bryan Cranston describing how someone gives their life’s passion “a shot” before giving up on it forever. I just picture a vibrant and smiling young actor ready to take on the world at the outset of his acting career, and then flash forward to same person twelve months later with slumped shoulders and a defeated scowl, shuffling off to a job that he will hate and resent for the rest of his life. All because he made up an arbitrary goal with an even more arbitrary deadline that he’s (also arbitrarily) decided will define the rest of his life. Cranston points out the stupid trap so many of us build around ourselves. We take this beautiful, pure thing that we love to do and we mess it up with self-criticism, comparison with others, and a lot of rules about how to achieve it. In my own experience, this rings so true. Starting something new means that any goal I define is likely loaded with misconceptions and misguided assumptions. Failure is just a dumb thing that you tell yourself to believe. The good news is you don’t have to. 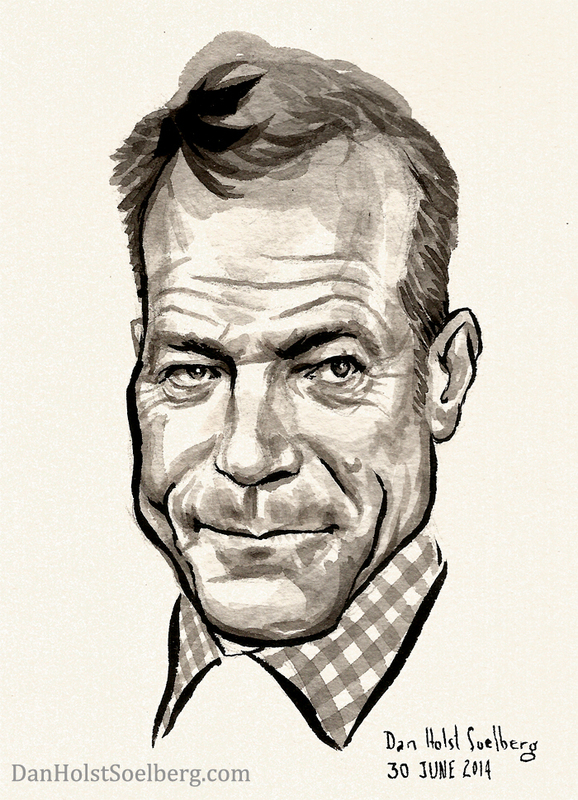 I like Cranston’s approach: commit your life to something you love right now, and don’t attach yourself to an outcome. Before I end this post, I thought I’d give a bit of a teaser for my new book. I’m being careful with how much I reveal, so bear with me. 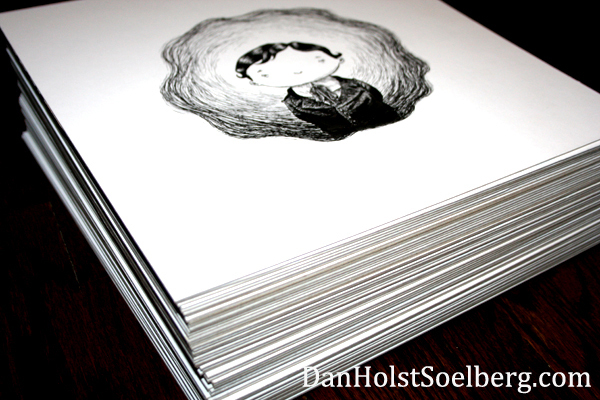 This is a photo of all the book’s finished drawings in a stack on my studio floor. I want to show you more so stay tuned. This is it! 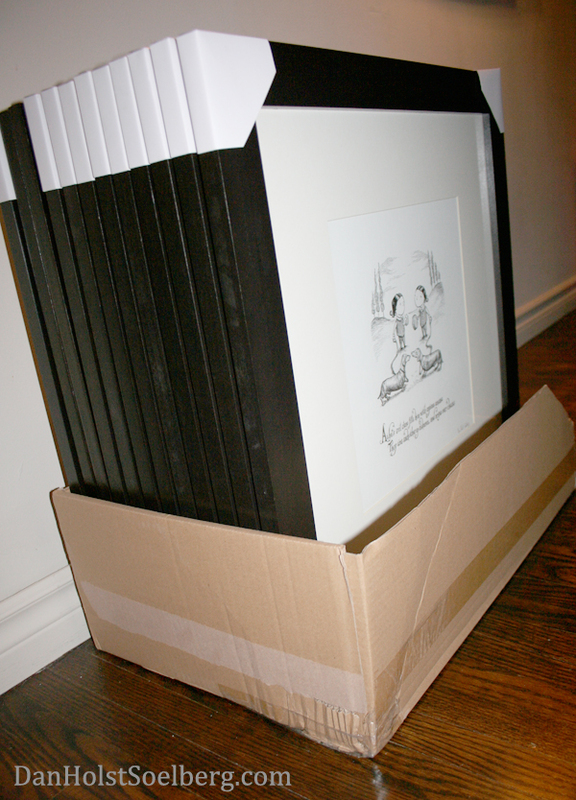 All the artwork for my new book is in this stack of illustration boards. My secret book revealed! Well, part of it, anyway. Thanks to all who came out to my art exhibition reception on Sunday. I appreciate your support. It was wonderful chatting with everyone and reconnecting with folks I haven’t seen in a while. It’s time that I tell you about a book that I’ve been working on in secret for quite some time now. If I count the very first rough draft and sketches from which the book spawned, it has been seven years in the making, possibly more. I’m happy to announce that the book is complete. Like my other books, this has been a labour of love and I can’t wait to share it with you! Unfortunately, I can’t make it available just yet because I’m not publishing it myself. I’m shopping this one around to literary agents, trying to find that special someone in the publishing world who understands what I do and can distribute the book to the world. This announcement amounts to little more than an unveiling of a promise that a new book is coming. I wish I could say more, and when the time seems right, I will. In the meantime, I can reveal a couple of the graphics that appear in the book. 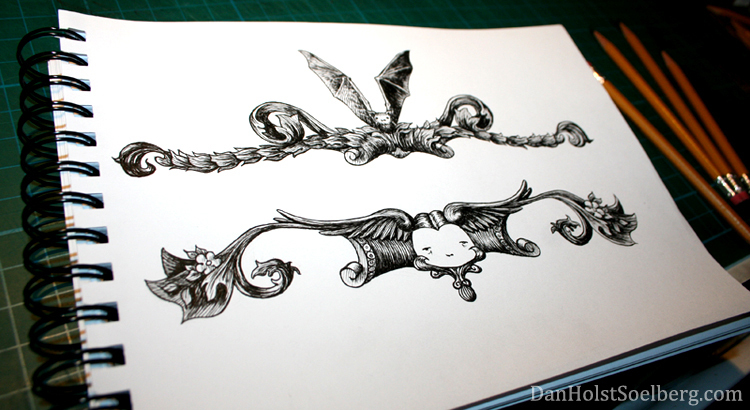 This is how I draw many of the little graphic bits and pieces for my books — just floating freely in a sketchbook. I then scan the drawing and move it around in InDesign when it’s time to do the layout. Stay tuned. This publishing journey has just begun. 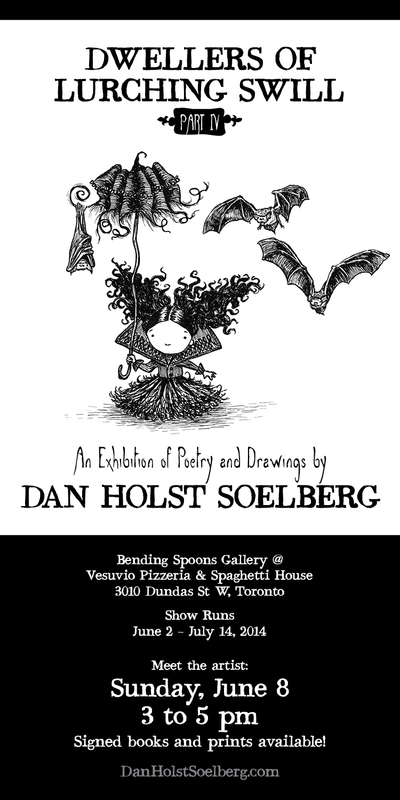 Just a reminder that if you want to see, or indeed, buy original artwork from my published book “Dwellers of Lurching Swill”, it’s on display at Vesuvio Pizzeria & Spaghetti House until July 14. You can find the restaurant’s address and other info by clicking here. My fantastic mother-in-law, Helen looked after the kids while Jaime and I hung my artwork in Vesuvio Pizzeria & Spaghetti House. Thank you Helen! Couldn’t have done it without you. Below are some photos from the set-up. Here’s a link to the exhibition details. Reception is Sunday, June 8, 3-5pm. Please note: If you wish to stay and eat after the reception please call ahead and reserve a table. Phone number is (416) 763-4191. I’m ready with supplies for my show, which starts today. Pictured from left to right are the artwork tags, my artist statement, and a sample of the published book. The book will be available at the bar for restaurant patrons to read. Artwork is framed and ready to hang for my exhibition at Vesuvio Pizzeria & Spaghetti House! My wife Jaime has become crucial to my exhibition preparation. 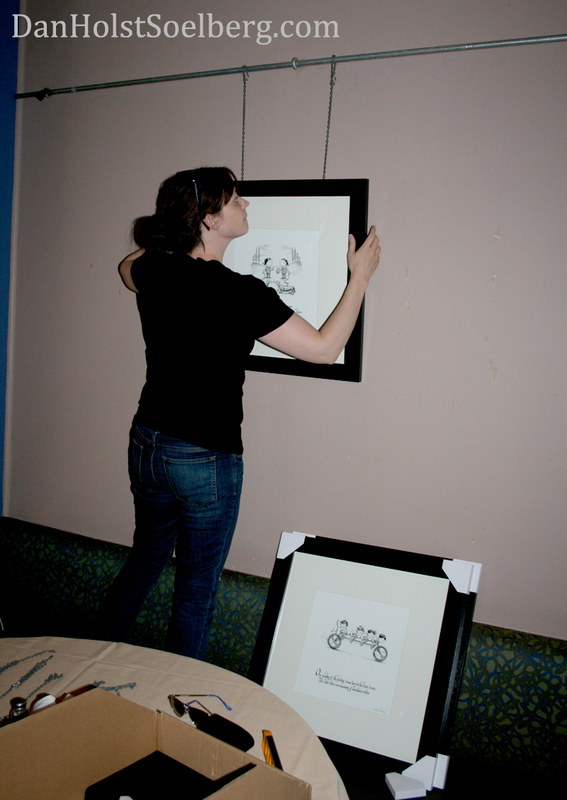 She helps with the framing and hanging to make each show a breeze to set up. I most definitely could not do it without her. 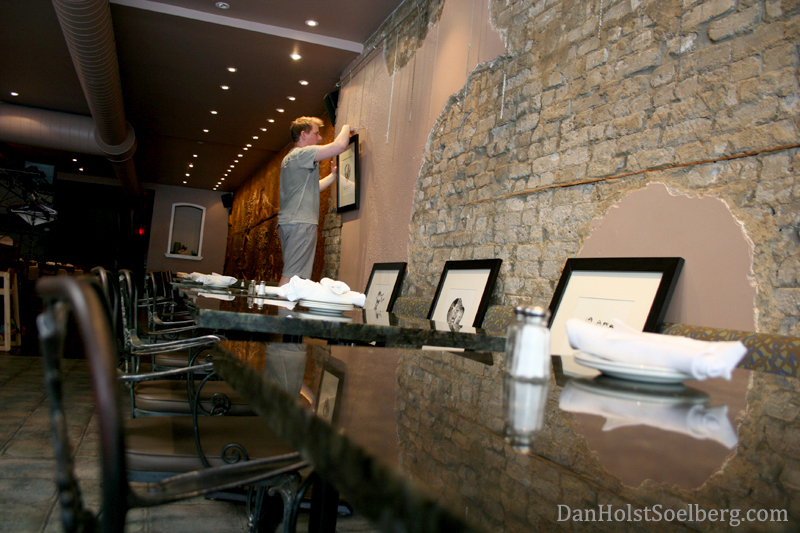 We will be hanging the artwork in the restaurant this afternoon. 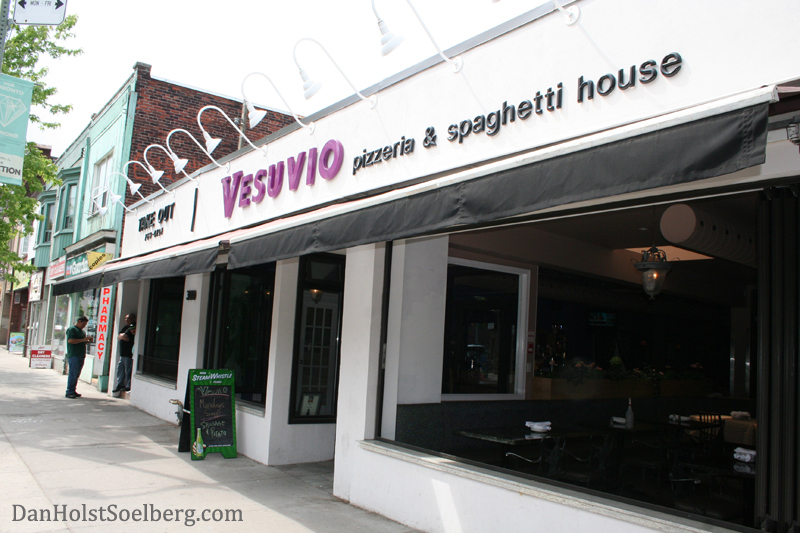 I have a long and happy history with Vesuvio. When I started out as an exhibiting artist nearly ten years ago, my work caught the eye of the owner, Piera. 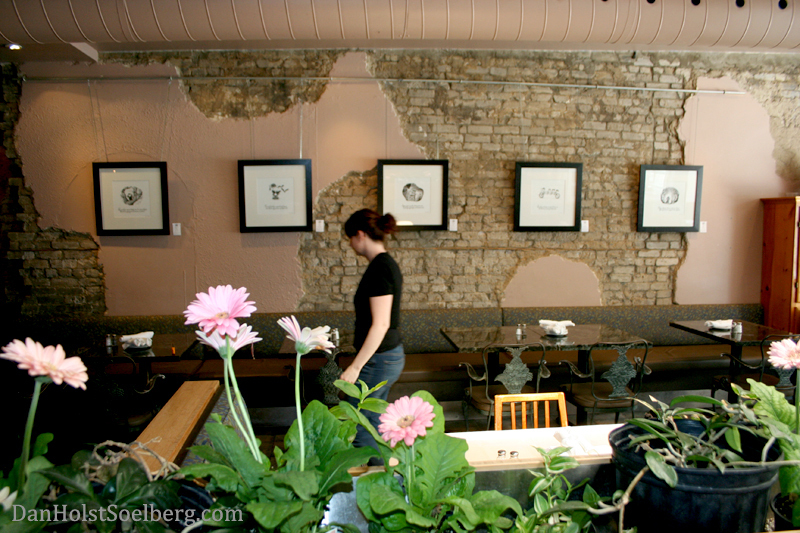 Piera has graciously invited me to exhibit in her restaurant every year since then and I am thrilled to do it. She is a fabulous host and her customers are incredibly supportive and receptive to my work. It’s a beautiful relationship that is blissful and effortless. Artwork is framed and patiently waiting on my floor. The show this time around consists of original artwork from my most recent publication “Dwellers of Lurching Swill.” Each artwork includes the poem associated with it. This is the fourth and last instalment of artwork from the book. Piera has told me that patrons routinely get up from their tables and walk around the restaurant to read all the poems. The most common question asked by diners? “Is this artwork from a book?” Because the book is now published there will be a copy of it at the bar for everyone to read. You can see sample pages and purchase your own copy at my online store. Click this link to check it out. The second most asked question is “Do you have prints of the artworks?” I can now answer YES! This show marks the first time that I will have signed prints of every artwork. $15 for each print or two for $25. I will be adding the prints to my online store soon. Reception is this Sunday, June 8, 3-5pm. Details are below, and you can let me know that you’ll be attending on my Facebook event by clicking here.